You are playing in a multiple deck game, and for purposes of this particular discussion, the specific rules variations are somewhat immaterial. You are dealt a seven and a five for a two card total of 12 while the dealer has flipped a six as his upcard. What this represents is a simple decision as to whether you're going to hit or stand. So what do you do with what is in front of you? Well, the correct play is to stand with the 12. 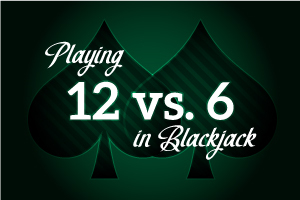 We have to accept the fact that the 12 is not always the easiest hand to play. In blackjack vernacular, it is termed a "stiff hand," because you can bust out of action with just one hit. At the same time, however, it's really the best of the stiff hands you can have. After all, if you take one hit, the only card you can bust with is a ten-value card. The dealer is sitting with a six, which is the worst upcard he can possibly have. He'll bust with this upcard a little less than 43% of the time. If you stand, you're counting on that busting percentage. So you'll win a little less than 43% of your hands. If you always hit the 12, you're going to lose at about the same rate - 56%, in this case, but you're going to win less - 3% less, as a matter of fact. So, even though the percentages are against your busting out with a hit, the overall win/loss percentage (the one that counts) dictates that you stand on your 12.